Automation on the manufacturing floor is nothing new. But the promise of a smart factory is a data-driven enterprise, where information from a system of embedded machines and interconnected production processes control automated production systems. Manufacturing robotics, for example, can run on lights-out mode with data being used to trigger automated decisions, such as control of factory-floor robots. Such lean manufacturing principles can deliver agile smart factories that maximize a key performance indicator: manufacturing uptime. Given that unplanned downtime is a costly endeavor — Aberdeen Research pegs the average costs for businesses at $260,000 an hour — manufacturing enterprises that implement fully connected automation systems stand to move ahead of the pack. Traditional automation through robots involves control within the plant premises. A programmable logic controller (PLC) or industrial PC directly takes the pulse of the robot by being connected to an interface which monitors its health. An entire assembly line of robots deployed on a factory floor is overseen by a supervisory control and data acquisition (SCADA) system, which connects the robots via a central wireless network and manages all of them. In traditional automated production systems, the manufacturing floor operators are still tethered to the plant floor, acting as benevolent overlords. When a system of alarms from the SCADA is triggered, they work to tweak or fix manufacturing equipment accordingly. The problem with such traditional automation is that it is not as close to the autonomous smart factory as manufacturing enterprises would truly like. For one thing, manufacturing personnel still have to be present on the plant floor. An additional complication is too many false alarms. Over the years, advances in robotics monitoring and associated alarm management systems have meant that the number of alarms in a plant have also gone up, as have the associated triggers. This has lead to robotics systems crying wolf too often, with manufacturing personnel being forced to react to alarms even when none to very little intervention might be needed. 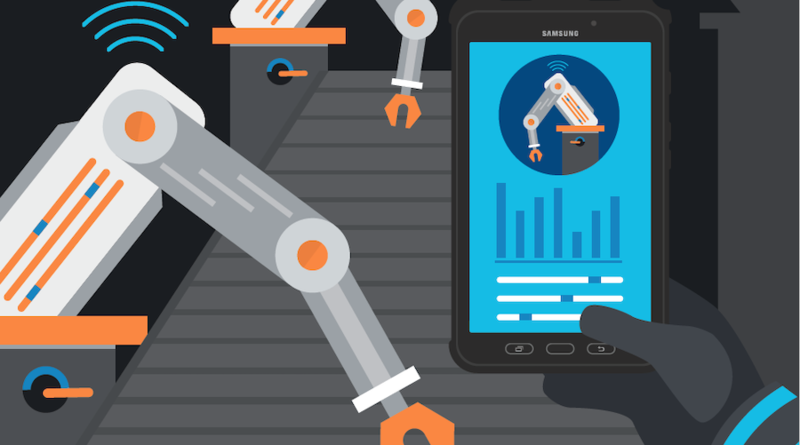 Smart factories are increasingly implementing smarter responses to robotics controls and alarms. Cloud-based reporting systems, for example, enable intelligent and remote monitoring by diverting alarms to mobile devices. Operators can program custom alerts in the cloud-based software and when an event is triggered, a text message is routed to the operator’s mobile device or smartwatch. Plant managers can then gain remote access to critical event data, download operating logs and even watch a video of the manufacturing process that can pinpoint event trigger points. More advanced systems can overlay current manufacturing conditions against an ideal one by using augmented reality and virtual reality renderings of manufacturing equipment, thereby making it easier to pinpoint flaws in the manufacturing process. Such a remote alert system liberates plant operators from being on the plant floor at all times and allows them greater control over numerous assembly lines at the same time. Since alerts are only triggered under specific event circumstances, the quality of the alarms and subsequent controls are also sharpened. Rugged mobile tablets and phones can support asset management and predictive maintenance on the production floor, all from one single platform. These capabilities capitalize on the true promise of the smart factory and move manufacturing robotics one step closer to complete automation. Original equipment manufacturers (OEMs) are also expected to leverage machine learning and artificial intelligence coupled with cloud-based technologies. In such systems, the trigger alert system is taken one step further, with embedded devices learning from past event logs to read triggers with greater intelligence. Remote operators can even log in to the robot’s human-machine interface (HMI) through mobile devices and perform rudimentary repairs and maintenance checks. A true smart factory can run on cruise control with data driving all processes, including robotic ones. Mobile devices lend themselves to such agile environments, as they free employees to move away from the manufacturing floor. This enables plant personnel to perform a wide variety of functions that can include robotics management, predictive maintenance, customer relationship management (CRM) operations and other types of routine asset management — all from a single device.